Where to stay in Kerikeri on a budget? In the heart of the Bay of Islands, Kerikeri is a fantastic place to stay when exploring the surrounding kauri and waterfall-filled forests and looking for seasonal fruit-picking work. It’s the perfect place to stay on a budget with plenty of backpacker accommodation. 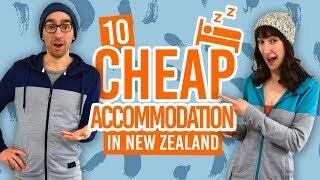 So what are the best backpacker hostels in Kerikeri? We’ll list what we recommend are the best Kerikeri hostels in this article. The majority of hostels are working hostels, meaning that they can put you in touch with local employers for seasonal work. Find out more about What is a Working Hostel in New Zealand. As for things to do in the Bay of Islands, a great place to start is with our Bay of Islands – Guide for Backpackers. Stay on the outskirts of Kerikeri in the lively Hone Heke Lodge. With an outdoor undercover courtyard dining area, table tennis room, TV room and huge garden, there are plenty of places to unwind after a day’s exploring or fruit picking. Choose from dorm rooms, private rooms and motel rooms. Plus, there’s free WiFi! The hostel is about 15 minutes walk from the town centre. Not your traditional backpacker accommodation, Relax a Lodge offers affordable double, twin and triple rooms in their farm house. Get involved with farm activities, jump in the pool, relax on the sun deck and enjoy the views of the surrounding fruit orchards. There’s free WiFi included. This BBH hostel is about 5 minutes drive from Kerikeri. This large hostel is located along the river and only five minutes walk from Kerikeri town centre. Choose from single rooms, double rooms, dorm rooms and camping sites with kitchen, lounge, table tennis room and barbecue area to share. The team can help you find local jobs too. Aranga Backpackers is part of the Kerikeri Holiday Park. Another awesome working hostel in the Kerikeri area, KeriCentral has long-term dorm options, as well as casual visitor rooms. As the name suggest, the hostel is centrally located in Kerikeri. Facilities include a swimming pool, free WiFi, kitchen, laundry and all those other little essentials. Situated between Kerikeri and Paihia, the Bay of Island Holiday Park is a good central option when looking for budget accommodation in the Bay of Islands. The Bay of Islands Holiday Park has a mix of affordable accommodation for backpackers, from cabins to campervan and tent sites. There’s all your essential communal facilities, a convenience store on-site, as well as a swimming pool and access to the river. Check Bay of Islands Holiday Park out!